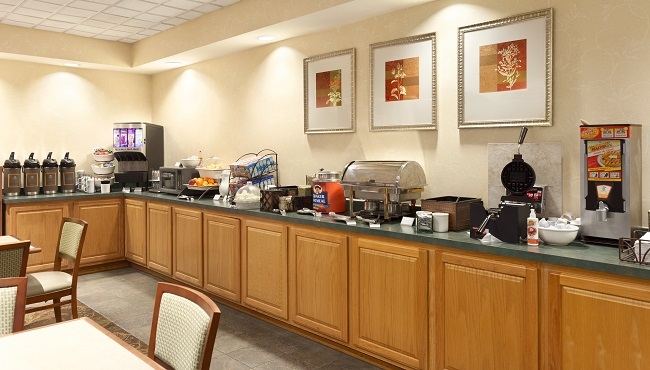 Before you embark on an adventure in the greater Baltimore area, pause for a wholesome meal in our comfortable breakfast nook. Indulge in Belgian waffles, eggs, muffins and more as you embrace the day at your own pace. You can also grab a breakfast bar and a cup of coffee to go if you have to be somewhere in a hurry. When you’re ready for lunch or dinner, head to one of several area restaurants, such as Cracker Barrel or The Olive Tree. Coffee, tea, cookies and fruit are served 24 hours. Sat/Sun: 7:00 a.m. - 10:30 a.m.